Lauer quoted criticism from Dobbs: "The Lorax is an example of the President's liberal friends in Hollywood targeting a younger demographic using animated movies to sell their agenda to children." Helms sarcastically joked: "I am so excited that Barack Obama, who is my best friend, got us going on this. Because we're going to indoctrinate a lot of people. If this goes well, I hope." He then exclaimed: "Lou, come on! What are you talking about?" Helms declared: "It's about a good guy who gets greedy. These are unimpeachable values, you know, like be responsible to your world." At the beginning of the segment, Lauer outlined the plot of the children's story: "The Lorax is the guardian of the forest, so naturally, all heck breaks loose when a young entrepreneur, voiced by Ed Helms, starts cutting down trees to make a product he calls a thneed." Helms described his character in a similar fashion: "So, the Wuncler is kind of the – he's kind of the villain but he's not a bad guy. He just – he's an entrepreneur who gets carried away and goes down the black hole of greed and avarice." A story about a greedy businessman who chops down trees, what could possibly be liberal about that? On Wednesday, Lauer talked to the voice of the Lorax himself, actor Danny Devito, who proclaimed: "Dr. Seuss wrote to everybody. He was prophetic. He talked about what was going on and how we have to take care of everything in the – you know, on our planet, to make it – to make it sustainable for all of us to live happy, long lives together as a species." The headline on screen touted Devito as a "Tree Hugger." 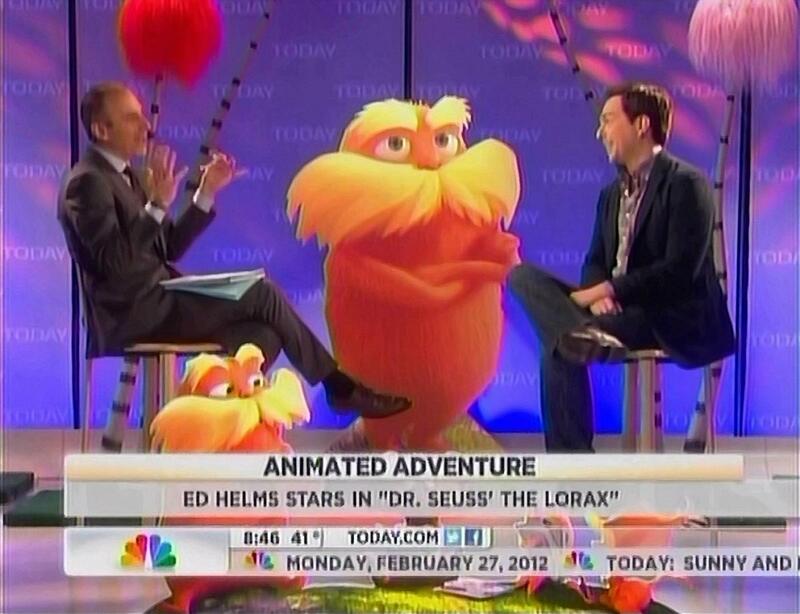 MATT LAUER: We're back now at 8:43 with one of the stars of the new animated 3d movie, "Dr. Seuss' The Lorax." The Lorax is the guardian of the forest so naturally, all heck breaks loose when a young entrepreneur, voiced by Ed Helms, starts cutting down trees to make a product he calls a thneed....For people who aren't familiar – it would be surprising if people don't know "The Lorax" because it's such a great book – but if they don't know the story, the Wuncler is? ED HELMS: So, the Wuncler is kind of the – he's kind of the villain but he's not a bad guy. He just – he's an entrepreneur who gets carried away and goes down the black hole of greed and avarice. LAUER: He sounds like a bad guy but you say he's not. LAUER: I know, he's naive, more than a villain. HELMS: He's also just, like all of us, he's vulnerable to these things, but it doesn't make him an evil guy. LAUER: Alright, so you know now, this movie, believe it or not, Dr. Seuss has sparked controversy with this movie because Lou Dobbs weighed in on this, the television host, and said that, "This is about a woodland creature who speaks for the trees and fights rampant industrialism," and then went on to say, "The Lorax is an example of the President's liberal friends in Hollywood targeting a younger demographic using animated movies to sell their agenda to children." Go! HELMS: I am so excited that Barack Obama, who is my best friend, got us going on this. Because we're going to indoctrinate a lot of people. If this goes well, I hope. It's about – Lou, come on! What are you talking about? This is – I – he couldn't have seen the movie yet either. Right? LAUER: Or maybe read the book, I'm not sure. HELMS: Or maybe read the book. It's – it's about a good guy who gets greedy. These are unimpeachable values, you know, like be responsible to your world. LAUER: Here's what Dr. Seuss said about it. By the way, the guy sold about a billion books worldwide. He said, "The Lorax doesn't say lumbering is immoral. I live in a house made of wood and write books printed on paper. It's a book about going easy on what we've got, it's anti-pollution, anti-greed." LAUER: I think he said that after that, "Boom! There you go." HELMS: Dr. Seuss said, "Boom!"